Back at the Poughkeepsie Yacht Club - That's All Folks! 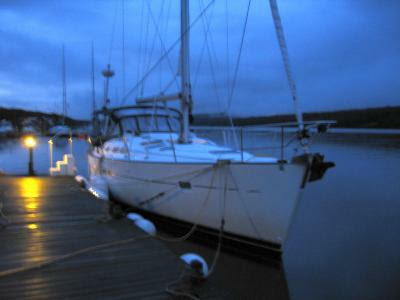 We spent a quiet night at the Haverstraw Cove. It’s completely protected from the bay, no waves can get into the anchorage and the surrounding hills provide protection from the winds. 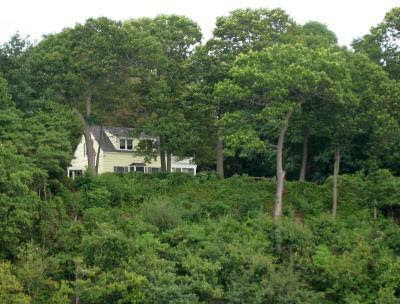 You just have to watch our for Fitchett’s Reef inside the cove. We left around 7:15 and headed north in light rain but the water was flat and we had a weak tide with us going north until around Newburgh. When we reached PYC around 1:00 we had great help from PYC members in docking, many thanks to the Fitchett’s and Phil Bowdler!! We later had wine and snacks with Sharman and Bill Fitchett before heading to the Eveready diner for sandwiches. We’re now on the boat for the last time this season, sad – and to top it off, it’s raining again as if to reflect our mood. 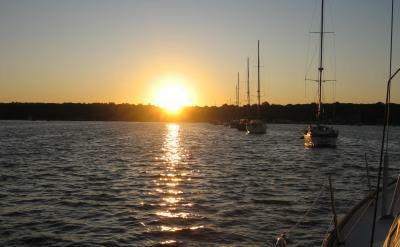 Some year we’ll continue on south down the ICW to Florida for the winter, we’ve got to make our boat time last longer! So long everybody, it’s been fun writing the blog and I hope you’ve enjoyed reading it. That’s all folks! We left Manhasset at daybreak with the rising sun so I took a rare sunrise photo. We had the current with us as we sped towards Hell Gate, intending to take advantage of East River being open on the weekend. However, along the way be caught a transmission on VHF that the west branch of the East River was closed after all! The east branch was still open but the Roosevelt bridge had to be raised to get through. After several frantic pleas for information from the Coast Guard and the bridge operator on channel 13, we finally learned that the bridge would be raised every ½ hour so you had to time your passage to coincide with that time schedule. With the rapid Hell Gate currents that reached 3.5 kts, that could be a challenge. I put the location of the bridge into the chartplotter and it automatically calculated the estimated time of arrival at the bridge given the current speed so I just sped up or slowed down to maintain the top of the hour arrival time. There were a half dozen boats doing circles, waiting for the bridge to be raised but we arrived just in time and were the first boat through. There were many barges sitting at anchor on both sides of the East River waiting, I supposed, for the river to be opened on the west side which wasn’t scheduled until 6:00 pm that evening. Without the barge traffic, the East River was relatively calm. Going up the Hudson, we passed several large liners in port. 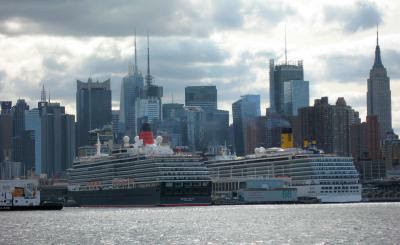 They make an impressive sight at dock with the skyline of NYC in the background! As many times as we’ve been through the passage by NYC, it’s still an exciting trip. We followed the waypoints listed on the chart published on the PYC website for entrance into Haverstraw Cove while avoiding Fitchett's Reef off starboard (which is shown on the chart as a submerged island). The lowest reading I saw was 6 feet at low tide on the way in. We're anchored in 25 feet for the night. There’s supposed to be rain tonight and tomorrow morning. If it’s too heavy, we may just wait around awhile for things to clear up or even come upriver on Monday. You can always track us on Spot to see if we’re on our way. The winds were predicted to pipe up in the afternoon so we got an early start after a quick trip for Hoolie relief. It was wind against tide on the trip out of Northport which made for a very rocky ride. 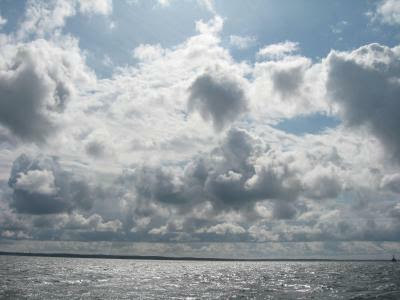 However, as we rounded the corner and headed southeast, the winds were to our aft so we were pushed along rather nicely. The winds continued to build and we recorded a gust of 31 kts of true wind as we sailed to Manhasset! 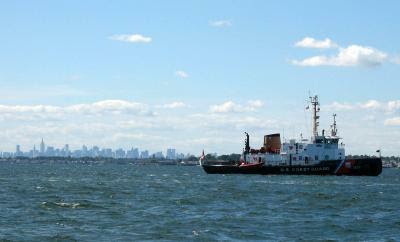 As we approached Manhasset we saw a Coast Guard cutter stationed at the entrance. We heard them challenge a vessel that apparently intended to make the passage through Hell Gate. I guess some people just don’t turn on their VHF, hard to believe. I’ll bet there’ll be a ton of boats going through Saturday morning! Later in the day we set in the cockpit and reflected on the summer’s fun. It is so hard to believe how quickly the summer passed. It’s our third year of going to Maine and we can’t wait until next year! It seems that time just keeps rolling along faster and faster. Remember when school let out and summer seemed to last forever, doesn’t seem that way anymore. I miss the slow times. Enjoy the present, everything else is a memory. We had just enough wind to sail, about 8 kts on average so we enjoyed the winds and warm weather until the wind died after a couple of hours. 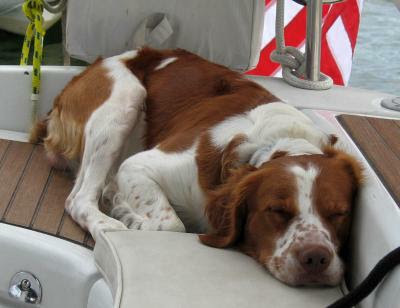 As usual, Hoolie curled up in his favorite spot on the port side just aft of the helm station. It seat fits the curve of his body and he can see out in all directions. 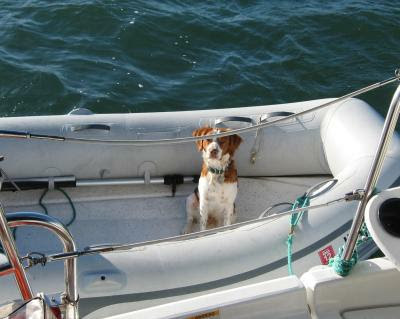 Funny how dogs are different, Lance, our previous Brittany Spaniel, never used that spot, he liked the rug by the hatch to the companionway. Also, Lance used to tremble when the motor was running but Hoolie isn’t fazed at all, he’s calm under motor and sail. 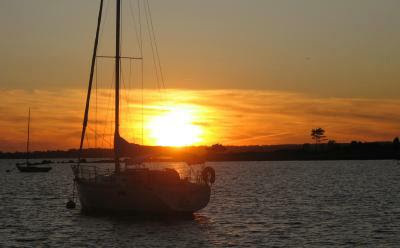 We anchored close to the north shore at Sand City near Northport since there was a 20 kt wind predicted starting at midnight out of the north. To the north there are the usual big houses you see on Long Island, all with a view of the water. It’s a little funny to see the trees all cut from the ground up to allow views of the water, it’s like holes in an otherwise continuous forest canopy. Onward to Manhasset. It was a beautiful day today, temperature in the high 70’s and lots of sunshine. 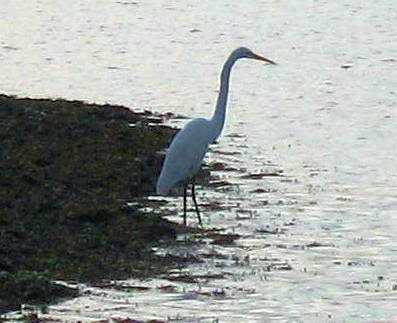 We saw a common egret along the shore. Even when we took Hoolie ashore nearby, it didn’t fly away. I guess it’s used to having people and dogs around. Since the UN was in session I thought I ought to call the Coast Guard about closings on the East River. I couldn’t find anything on their website so I called the main number for this region and found that yes, the East River was closed, both the west and east branches (under the bridge that has to be raised). For Wednesday the east branch was open but only from 1300 through 1500. You had to call ahead to get the bridge raised too. Other than that narrow window, you couldn’t traverse the East River at all! However, the UN does not hold sessions on the weekends so our Saturday departure through the East River is still okay. Ann spent part of the day painting with watercolors. She sets up shop in the cockpit and paints the view from there. She only took watercolors along and not the pastels since the watercolors are much neater. The dust from the pastels is harder to control but we’ll try that on a future trip. 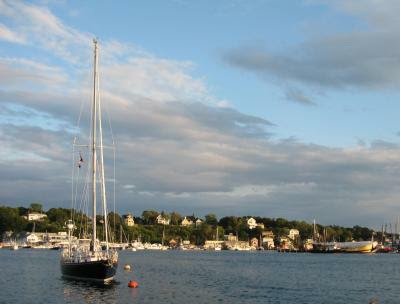 Thursday we’re headed for Northport and the Sand City anchorage. There’s supposed to be a high north wind that night and that anchorage offers good protection from that direction. 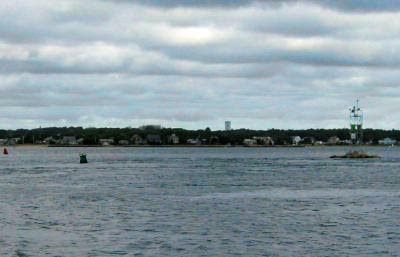 We usually cross over Long Island Sound at Port Jefferson. It’s a pleasant sail, usually, but today there was only 4 or 5 kts blowing so we motored most of the way but we did sail (at 2.8kts!) for a couple of hours. We go off to the right as you come in to anchor (the western anchorage). We’ve anchored there so many times that we have all the best spots entered into the chartplotter. Today we had our choice since we were the only boat in the anchorage. Soon after dropping the hook we were visited by the local greeting committee of swans. Ann made the terrible mistake of feeding them (“they look so beautiful!”) and one hung around the boat hissing for several hours. Hoolie finally discovered we had company and was vitally interested in greeting them. They didn’t seem amused and hissed at Hoolie whenever they saw him. They were definitely not afraid of Hoolie and didn’t back off one bit. 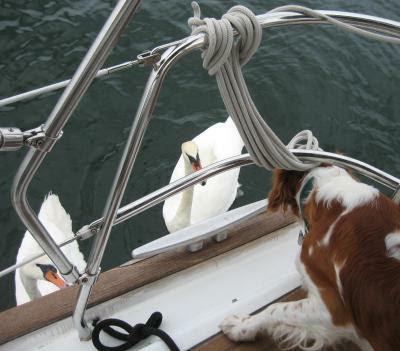 We kept Hoolie attached to the center cockpit table with his leash just to be sure he wouldn’t dive into the water to play with the swans. As I said before, one swan hung around waiting for another hand out and only left after we went for a dink ride. No more feeding swans! 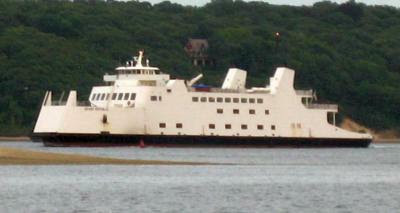 The Port Jefferson ferries are alive and well but at least they are on AIS so they are easy to keep track of now. Who can forget the experience of having one of the two ferries bearing down on you at 15 kts as you entered or left the narrow fairway between the breakwaters at Port Jefferson?! Last year they changed the speed limit to 5 kts for everyone (ferries too!) just before entering the breakwater so it's not quite as daunting now. Meanwhile, we’ve mapped out the rest of our cruise and it looks like we’ll arrive back home at the Poughkeepsie Yacht Club around 1:00 pm on September 27, a Sunday, if the current weather predictions hold up. Wish summer lasted longer. 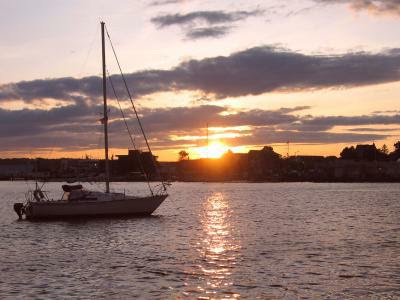 With a prediction of very little wind, we decided to go for Branford instead of the Connecticut River. It’s roughly 45 miles from Stonington but the flood tide was with us all the way and we averaged over 8 kts most of the way and at one stretch hit 9.8 kts. The seas were absolutely flat but the sun was out and it was warm in the cockpit with the sun flooding in. As we passed the entrance to the Connecticut River we heard the railroad bridge operator announce that the bridge was suddenly out of order. The last train had evidently done something to the bridge so it couldn’t be raised. The bridge operator said that help was on the way but he didn’t know when it would arrive nor when the bridge would be fixed! There must have been some unlucky people north of the bridge on the river, glad we weren’t one of them. We got a dock at Brewer’s Bruce and Johnson Marina and they now have a Brewer Cruising Club Card. 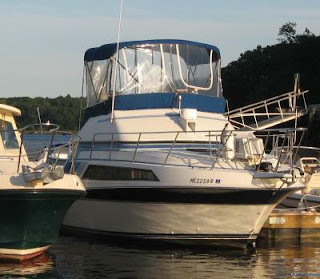 You get 25% off all future stays at any Brewer marina and a nickel off per gallon on fuel. It appears they had to take action to attract customers. They are even offering winter storage at ½ price if you have a card (which is free upon your first stay). I’m glad to see someone responding to the economy. 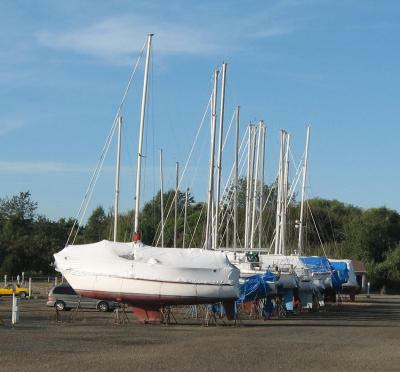 Most of the marinas were just suffering through the recession without doing anything to lower their prices. It appears none had taken economics 101 (higher prices = less business, duh.) A 25% price increase does not bring in 25% more revenue – people go elsewhere. Unless, of course, if you own a house – you’re less mobile but eventually people move away – a fact lost on most school boards. There’s lots of boats out of the water already, perhaps taking advantage of the 50% discount. 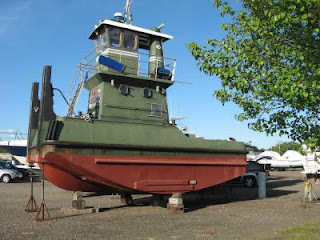 A strange looking tug is among the land fleet. Passing by all this, we walked to Lenny’s for their specialty, fried clams. 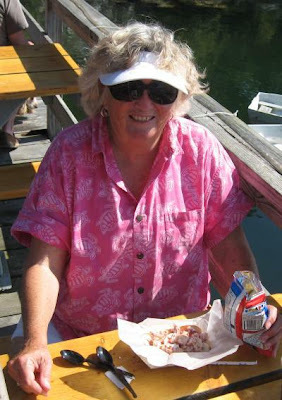 We had fried clams all up and down the seacoast and thought some of the places had pretty good clams and might compare to Lenny’s. Boy were we wrong! One bite into a plate of fried clams (whole, not strips!!) proved we were wrong to even consider the possibility of anyone being in their league. Their clams are juicy but most of all, sweet and fried to perfection. No other restaurant had clams that came close. 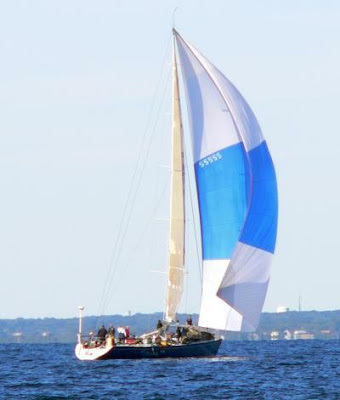 Tuesday we head for Port Jefferson and hope for a little breeze. Stonington is not far so we decided to use the morning to explore Block. We dinked to the dock at the Oar House and walked into town. The day was just perfect for walking; full sun, temps in the 70’s, no humidity and a cool breeze. The old port was a busy place with lots of tourists. It’s a fair walk so when we returned to the Oar House we elected to have lunch. We just ordered from the appetizer menu. Ann had buffalo wings and I had tuna but the portions were enough for a full meal! 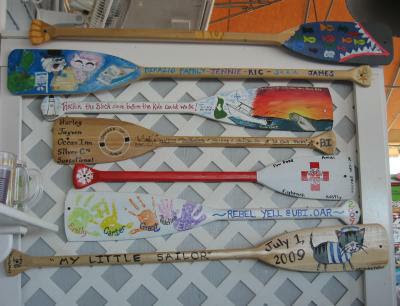 The place gets its name from the custom of displaying decorated oars donated by customers all over the restaurant. There must be over 100 oars, probably more mounted on the ceiling, walls, partitions, over windows, etc. It’s a popular stop for all boaters. I would certainly recommend the place, excellent food. Returning to Fleetwing, I snapped a photo of our new flag, one your can see from a distance! We weighed anchor and headed for Stonington. Although it was a beautiful day, there was little wind and since we left so late, we couldn’t take advantage of the 5 kts wind breeze to laze along, we had to motor. Arriving at Stonington, we found McKinney’s mooring again and when I picked it up, it was covered in shells and seaweed! It obviously had not been used all summer. I ran a line through the eye which held it away from the boat and tied off on a cleat. My thanks to McKinney for the use of his mooring! There’s predicted to not be much wind Monday either and if so we’ll head for Branford, depends on the weather. Meanwhile, we enjoyed another fine sunset! We had about 35 miles to cover so we couldn’t take advantage of the lazy winds and sped along under the iron genny. Nearing Block Island we started to see the racers. Huge boats with even larger spinnakers. They are an impressive sight. The Great Salt Pond at Block Island was not crowded and we even saw empty moorings, something very rare during the summer season. However, we always anchor at Block, there’s lots of room and it’s closer to shore for our Hoolie trips. 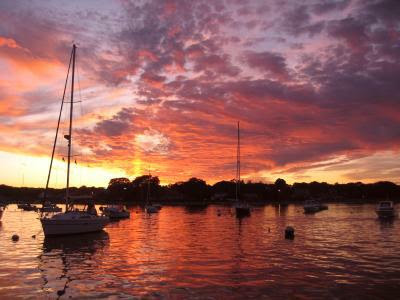 It’s calm tonight, clear skies and Sunday we head for Stonington and McKinney’s mooring if it’s still there, otherwise we’ll anchor. It’s good to be back in protected waters and we’re thankful the hurricane season has been so calm. May it continue to be so. The winds blew a steady 20 to 25 kts all day long with one gust recorded at 28 kts! Since the winds were out of the west, the direction we wanted to go, we decided to have another layover day. Perhaps we can leave Saturday if the winds abate as predicted around noon and swing around to the northwest. The genset behaved itself all day today, a big relief. However, the camera decided it wanted its share of attention so I have no photos for today. The memory card died in the camera. I have since replaced it and now the camera is working fine but that was after photo ops had passed. We had a new flag and flag pole to put up and I confidently got it out and went to insert the bottom into our holder and found it didn’t fit. Don’t all teak flagpoles have the same base diameter? Apparently not. So I started whittling and filled the cockpit with wood chips but did get the diameter down enough to fit the rail tube for the pole. Ann wanted a bigger flag so we now have a 60 inch flag on display off the aft of the boat. I would have gotten a photo but…. We could have moved on today but why do it? We would have had 20 to 25 kt winds and quartering seas. 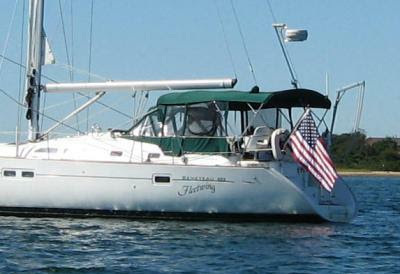 We rather sail in more comfortable conditions and besides, we’re retired, we can take al the time we need (I don’t have to go to work on Monday…) With that philosophy, we’ll probably stick around until Sunday when the winds settle down and head for Stonington in one hop from Cuttyhunk. Meanwhile, after taking Hoolie ashore, we noticed a guy in a dink with a dog holding on to our mooring and his wife in the boat ahead of us waving frantically. It turns out that he was on his way back and had a problem with his motor. We threw him a line and towed him back to his boat. Later that morning I returned to see if he needed a ride into shore for his dog but he had already gone. On the way I noticed a line floating on the surface of the water, a real danger in a crowded anchorage. Since the line was ahead of the boat (in the direction of the wind), any boat with a fouled prop would head straight for Fleetwing! I called the problem into the harbormaster and he promised a quick trip out. About ½ hour later he finally appeared. He looked around but didn’t see any line and I’m sure he was thinking bad thoughts about an overactive imagination of a transient boater (me). I went out on the bow and he turned and said, “Where’s the (clunk!!) line…” He had picked it up on his prop and now he was drifting downwind, away from me, luckily. He hauled on the offending line and found that it was wrapped around one of the moorings. He cut the line before freeing his prop of the rest of the line, I would have thought he’d do the opposite but then I’m not a harbormaster. The rest of the day was not near as exciting but then we had a beautiful sunset and Ann took some more cloud photos for her paintings in the fall. I had another session with the genset (it overheated this morning) but now I think everything’s working. Never a dull moment. Winds were predicted to be out of the northeast at 20 kts most of the day. Since we were headed in the exact opposite direction, we set out with the tide behind us at 9:00. We ran at 12 kts per the GPS for quite awhile! With current and wind in the same direction, there wasn’t a build up of waves action at the mouth of the canal. I imagine that later in the day when the current reversed it was quite exciting to enter the canal from the west! We’ve seen that result in the past, the waves break over the bow of the boats since the waves are tall and short due to the opposing current. We passed by the entrance to Onset but we would never attempt the entrance in such current. You have to go between the two green markers shown in the photo. It’s actually much narrower than it appears in the photo. You pass the red buoy to starboard that you see in the corner of the photo. We continued on, wing on wing towards Cuttyhunk. After a bit we just set the autopilot to maintain a constant angle to the wind and it managed to do that without a mishap for the next three hours, wing on wing all the way. Along the way Ann snapped several pictures of clouds; they will find their way into her paintings later in the year. Entering Cuttyhunk, we picked up a mooring due to the prediction of high winds throughout the night (it’s blowing 25 kts now!) and with the sun out and our cockpit closure, it was warm in the afternoon. The trip in for Hoolie relief was a blast with the wind and wave action. Cuttyhunk is protected 360 degrees but with 25 kt winds, the waves still built up enough to bounce a dink around. Meanwhile, I was finally able to get the raw water pump on the genset to pump water so now the genset is functional again. The weather prediction is not good, too much wind and waves. We have a potential window tomorrow morning but not likely and after that the next window for us to go west will be on Sunday. Most likely we’ll be in Cuttyhunk for the next three days. With a working genset, a freezer full of food, an internet connection and a working cellphone, that’s like being at home. On a boat, you travel when the weather permits. Another bright and sunny day and we got started around 9:00 or so. We sailed for the first couple of hours but then the wind died and we had to motor the rest of the way. 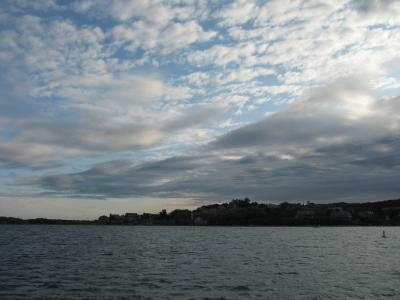 As we motored south into the protection of the cape, the waters got even calmer – like a lake. We had made reservations at Sandwich over the internet and took our dock immediately upon arrival. 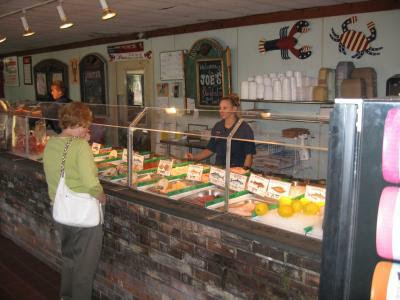 We’ve been here before so our first order of business was a trip to Joe’s Lobster Mart for fish. Ann selected halibut and we came back to the boat. That’s when the adventure with the genset started. I had noticed that the water was not coming out of the exhaust like it used to so I measured it with a bucket this afternoon and found that the flow was only ½ what it’s supposed to be. With that I replaced the impeller in the raw water pump and closed up shop thinking that the problem was solved only to find out that now there was no water coming out at all! Putting a hose directly on the input to the Panda genset I found that the pump would not draw water at all! After many hours and many reinstallations of the impeller and O-ring, the pump still would not work – arrrgh! All very frustrating! Ann served a late dinner (too late for her I think) and then I started working on the problem again but to no avail. I quit around 9:00 and plan on calling Panda for help Wednesday morning, wish me luck. After a quiet night we hear a racket in the morning and saw a Coast Guard helicopter land at the nearby Coast Guard station. He came in very carefully and sat it down on a rather small platform by the water. I guess the station at Gloucester is bigger than I thought. We lazed around for awhile and finally got started at 10:00 when the wind came up. We found about 10 kts out of the west which was perfect for us since we were headed south. By now the seas had calmed with very little wave action and there was no further build up since the wind was off the land. On our way south we passed Boston in the distance and there were five large vessels waiting for clearance into the harbor. We listened in to their chatter over the VHF. One ship had divers in the water and we wondered if it was because of lobster pots? (or whether they’re even affected by such things). In Boothbay Harbor we talked to the captain of a whale watch ship and he said they used divers about once a week to clear off the lobster pots! 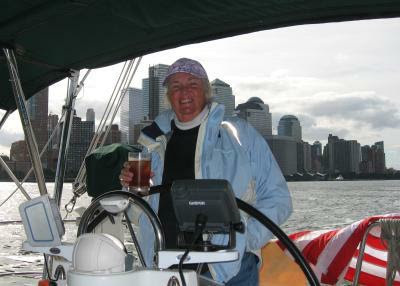 Ann and I took turns at the helm, usually ½ hour at a time as per our usual practice and we had a most pleasant sail. There are a lot fewer lobster pots in this area and this time of year which added to the enjoyment along with the full sunshine and warm weather. Coming into Situate we radioed Satuit Boat Club for a mooring and received prompt service as usual. I barbequed pork on the grill and Ann made Apple Charlotte. The wind and currents cooperated so the aft of the boat presented a great view of the sunset as we watched the colors develop and spread. There was even a sun spike, a yellow, vertical streak to add to the show. We live in such a beautiful world! Today turned out much better than we expected. There were some light fog in the morning but it cleared before we set out around 9:00 am. Getting out of the dock we encountered the river current, about 3 kts! Due to the direction of the current, we had to make a 180 turn so we could approach the fuel dock against the current, quite exciting in the narrow channel but all went well. We use about 1.1 gallons per hour counting genset usage too. Well, we motored since we had 35 miles to cover and no time to make use of the 5 kts of wind we had. Once we get to the Sound, we’ll take it easier. 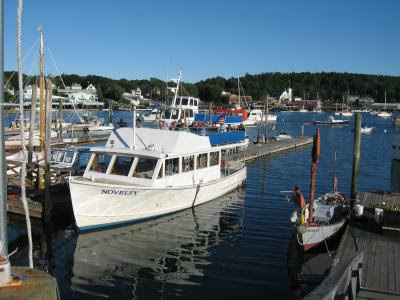 Gloucester is a working harbor but the town does provide moorings at $25/’night for cruisers. We picked up our favorite one and were cheerfully greeted by the harbormaster, nice folks. On to Situate Monday. Today was a stormy day with rain and wind all day long. The winds stayed at 20 kts outside the harbor with 5 ft waves and rain. With that we decided to stay another day at Portsmouth. We had a dock at the very end of the outermost finger so we always had a long walk to the main buildings. Wentworth has a courtesy car at no charge for use by visiting yachtsmen which we took advantage of with a trip into town. We found a barbeque place to try out which was not bad but didn’t compare to down south. 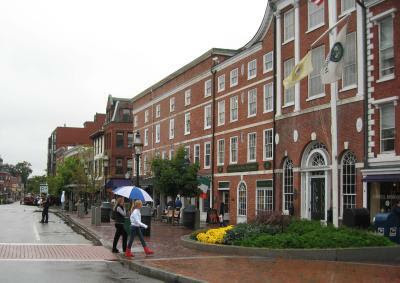 Downtown Portsmouth has reinvented itself and it’s an interesting place to visit with lots of small shops. We even found a fromagerie (cheese shop) and we tasted several varieties but they didn’t have camembert, the cheese I liked the best while in France but they had other varieties that were very good. So we bought cheese and wine to have before the BBQ which we brought back to the boat. Sunday we’ll head out for Gloucester barring really bad weather, got to get south. We started out in good spirits today around 7:00 am aiming to get a good start for Portsmouth. At 46 miles, it’s the longest leg of our trip home. However, today was not as good as forecasted. The waves were measured at 5 feet by the buoy recordings and I think a few were larger than that! The wind was supposed to die off in the afternoon but instead it built up to 20 kts. All this made for a very rocky ride south. We finally made it into the harbor, such calmness!! I wrestled with the lines and fenders while Ann docked the boat and we made it in okay. I was going to take Ann out to dinner at the Wentworth but we found ourselves just too tired from the heavy pounding and decided to have hamburgers instead. The forecast for Saturday is not very good and we may very well spend another day here before heading for Gloucester on Sunday. 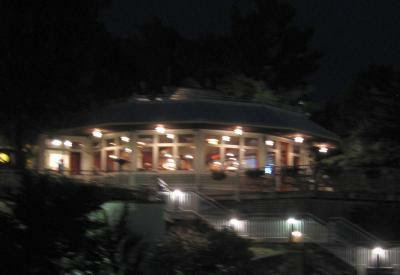 The photo is of the restaurant that overlooks the harbor, a great place for an evening meal after a say of sailing. We’re feeling the need to head south while the hurricanes seem to be absent for awhile. 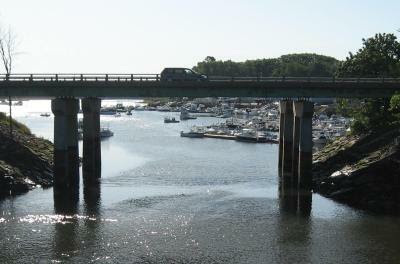 You can see from the photo that Yankee Marina is at the very end of the Royal River. That’s the 495 bridge you see in the foreground. Yankee Marina finished their work this morning and I filled the water tanks. Our system is to use a house filter with a carbon element to further purify the water. The filter assembly is heavy enough to stay in place even with the pressure of the water coming out. 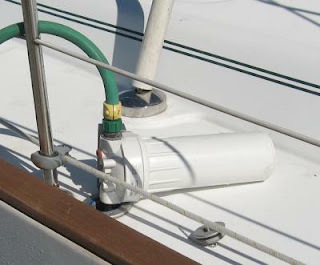 You don’t have to stand there and hold the hose against the input opening of the tank, very convenient. For drinking water, we have a Seagull filter at the galley sink to provide yet another level of filtration. It saves having to cart around drinking water in additional jugs. As I said, we are now seriously headed south and our first stop was at South Port Marina in Portland. 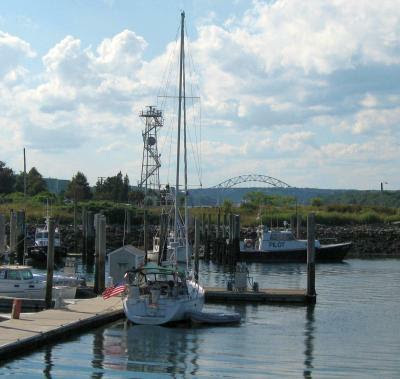 It’s the most protected marina in the Portland harbor and it’s located at the extreme southwest corner of the harbor, far away from harbor waves. Looking at the weather forecast tonight, we’ll probably head out Friday towards Portsmouth, NH, we’ll see. Meanwhile, we enjoyed the view of Portland from across the harbor at South Port Marina. Today we had a team of people working on the boat all day long. The Volvo alignment to the propeller shaft was adjusted to spec but not without first rebedding the engine supports. They had to be lifted with a shim so the adjustment screw was not at the top its travel; a bad thing for stresses since the entire forward thrust of the engine is against those four bolts. I also replaced the small, stock fuel filter with a much larger model that easier to change. On the genset set, the valve clearance was adjusted, the fuel injector replaced (it was leaking), the electrical output voltage of the genset adjusted upward (too low), the genset support was reinforced and rebedded along with much sound proofing. I’m anxious to hear the result of all the upgrades. It ought to be quieter in the cabin. Meanwhile we went sightseeing and wanted to stop off to tour the Portland Art Museum but couldn’t find parking which I thought was strange. You would think they would have a dedicated parking garage but they didn’t. Failing in that we found a fish market and bought tuna! Back to the boat which was blanketed with workers so we took off again for the Maine Mall. 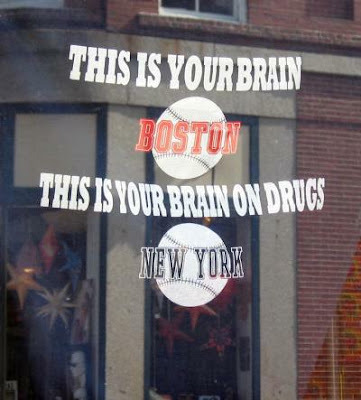 Along the way we saw a sweatshirt hanging in the window that displayed what they thought of Yankee baseball fans! Upon our return the boat was still a busy place so we decided to stay another day to let everyone finish at a rational pace (instead of staying too late), Ann prepared the tuna and we had a great meal with a bottle of chardonnay. Well, today was an education. Yankee Marina is certified by every manufacturer I can think of and I believe they know their business. I had them look at my Panda genset and the Volvo diesel since neither had been professionally serviced for quite awhile. The discussion that ensured was enlightening. The fuel pump/oil filter combination were mounted backwards. Teflon was used in the diesel fitting joints, a no-no, it degrades when in contact with diesel fuel. Non-marine grade fuel line was used (automotive type) and it was under-sized per the mfg specs. Panda specs were not followed in the mounting of the genset resulting in excessive noise transmission to the cabin and a potential for mechanical failure of the bedding. It goes on and on. The Volvo was much better but when the alignment was done, the extreme upper end of the adjustment screws were used, not recommended by the manufacturer. All this is in the process of being corrected and should be completed by Wednesday night. Meanwhile, we decided to rent a car for our two days at Yankee Marina for trips to Freeport (L.L. Bean), Hannafords for reprovisioning and Portland. We found an Enterprise auto rental dealer in Portland which offered a small car for only $35/day and they would come and pick you up for transport to their center at no charge and return you when you returned the car. So after conferring with Yankee Marina on what was to be done, we headed to Freeport. L.L. Bean has expanded enormously compared to the last time we were there (10 years ago?). The single Bean store has morphed into five equally large specialty stores, just a huge complex. Unfortunately, the rest of Freeport seems to have shrunk. 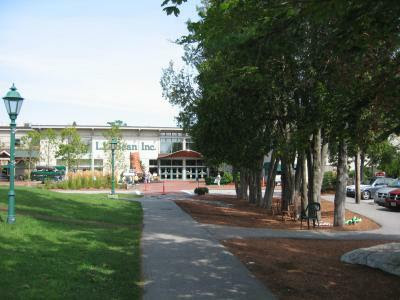 Although the area had been attractively upgraded (new stores, brick walkways, landscaping) many of the tenants have left. Although L.L. Bean was better than ever (big boot and all! ), we left somewhat dissatisfied due to the lack of other stores. We found a Hannafords nearby and restocked on the way home. We were sitting on the back of the boat when we saw this contraption go by (see photo). It turns out that it was a valid entry into the lobster boat races and did very well given the twin 200 hp outboards mounted on the rear. The bottom hull was cut from a lobster boat and the car has a lobster pot hauler mounted on the left front wheel – so it met all the qualifications for a lobster boat per the race specs! 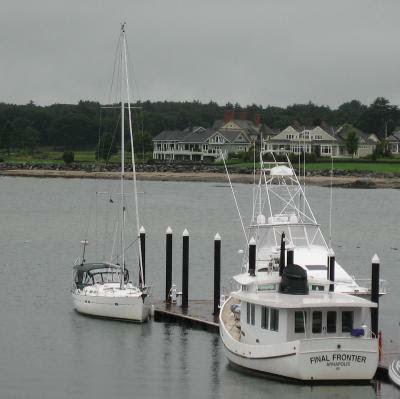 We’ll explore Portland tomorrow while the last of the boat projects are completed by Yankee Marina. It was 57 in the cabin this morning so I ran the genset to power the heat portion of the A/C. By the time Ann got up it was nice and toasty in the cabin! Back at the Rockland boat show we had met a representative of Yankee Marina who had a Panda genset on display just like ours. Since our Panda hadn’t been serviced other than routine oil and coolant changes since we bought the boat in 2004 (other than the manatory 35 hour valve clearance adjustment), we decided to have Yankee Marina do the work. 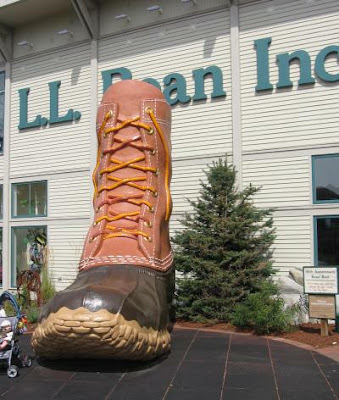 Of course, just next door is Freeport with all the shops that Ann likes to visit such as L.L. Bean and others. So with the boat being worked on, we’ll go next door and see what L.L. Bean is up to. 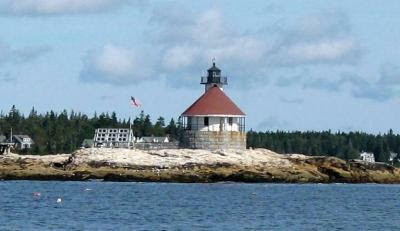 On the way out of Boothbay Harbor we passed a strange looking lighthouse, they come in all shapes and sizes in Maine. What wind there was came right on the nose so we just motored west. At least the seas were calm and we made our usual 7.3 kts. Yankee Marina is located after a long trip up the Royal River. There is a dredged channel that’s supposed to be 8 feet a low but I saw 6 feet coming in after allowing for the tide height. You really have to watch your P’s and Q’s since the channel is very narrow, less than 30 feet in places! Once in the marina, I noticed a power boat across the way with the radar mounted at just the right height when the owner is at the wheel... (the white box right under the blue area). That's where the manual recommends! Yankee Marina looks like a going outfit with a full service yard. 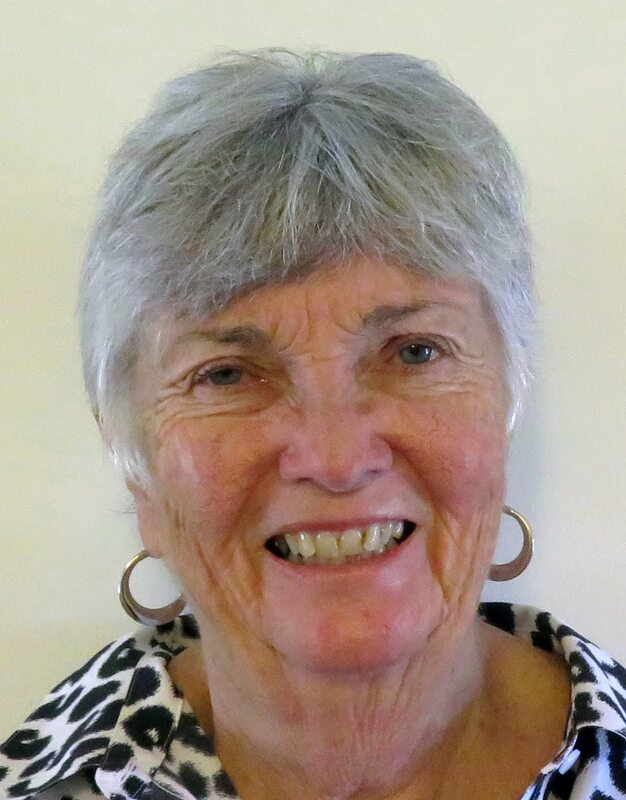 I look forward to seeing Dana tomorrow, we’ve shared many calls and e-mails. It was another fine, blue sky day but cool in Boothbay Harbor today. Still, it reached into the 70’s under the full sun. Tomorrow’s high is predicted at 65 so it’s definitely time to head west and south. This morning though we walked Hoolie and then went into town for a paper and our traditional donuts on a Sunday for breakfast. 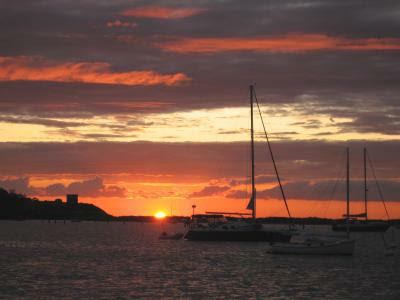 We consumed the Boston Globe on the back of the boat and lazed away the morning. We asked the breeder what tips he had on getting Hoolie to be better on a lease. He recommended a “kennel lead” which consists of a rope with a ring on the end that you loop the rope through like a choke collar except it made of rope and not chain. I made one from spare rope and a brass ring I had on board. Additionally you’re to carry a paper tube from a used roll of paper towels and give him a swat if he barges ahead of you. It makes a wonderful booming sound and after awhile, all Ann had to do was to slap it against her leg to get a response from Hoolie. He is improving, just not very quickly. There was a lot of activity in town with boats coming and going, plenty of cruises to select from. It’s been a great weekend for the town. To celebrate our last day we returned to Kalers for a late lunch. They had $1.50/glass house wine and fried clams. 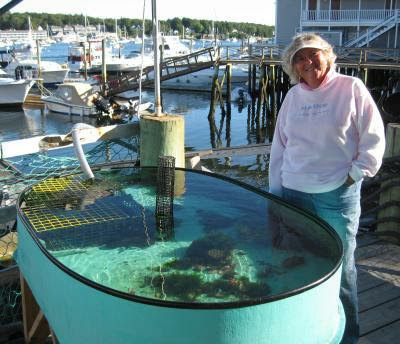 They have an outside lobster tank which we inspected. They encourage you to pick up the lobsters which Matthew loved to do, we left them alone. 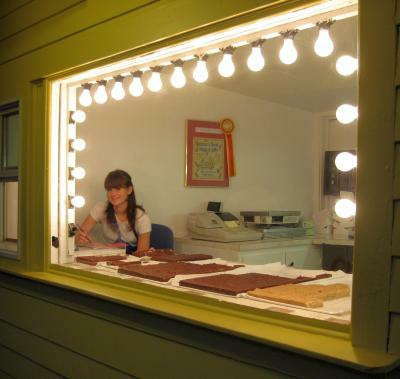 After dinner we made our annual pilgrimage to the fudge factory which we’ll consume over the next few days. What a selection, it all looks so good. We reminisced on our summer in Maine and all the fun we’d had. We’re already planning our trip next summer! It was supposed to be partly cloudy with a high of 70 but we actually got full sun with a high around 78, really nice weather we’re having now. Every Labor Day weekend Boothbay Harbor has a juried art show on Saturday so we went to take a look. It was a nice exhibit with watercolors, pastels, oils and photographs. Ann talked to one artist that said he had to submit examples of his work and if good enough, he would be invited to attend, so it’s not open to just anyone. The works were all technically proficient but I like Ann’s work better. A good or bad painting is all in the composition. Rarely do you see bad execution at this level. That said, I didn’t care for most of the compositions. 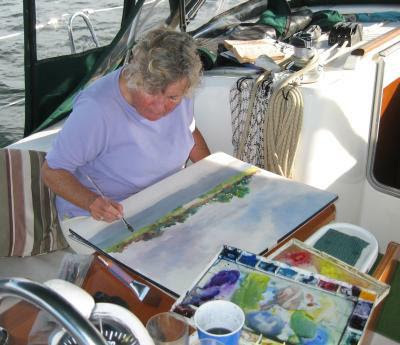 Artists from all over Maine attended, not just from Boothbay. Sufficiently refueled, we toured the harbor in the dinghy with Hoolie on display, we got lots of waves for Hoolie. 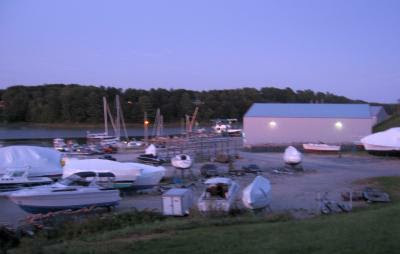 There’s a local yacht club in a cove to the west of Boothbay. It’s very protected but they wanted $35/night for a mooring instead of the $26/night that Tugboat Inn charges. Plus, they’re way out in the boonies, it’s a long walk into town. 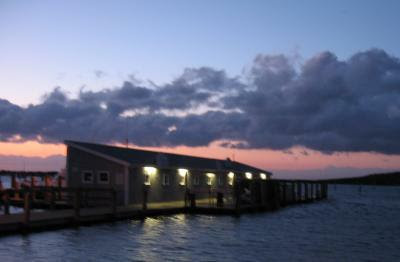 We’ll stay with Tugboat Inn. 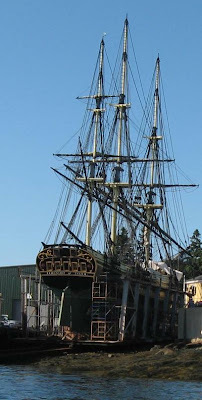 On the way back, I got a better photo of the three masted ship that's under restoration at Boothbay. It's some sight seeing it up close. I imagine it will be a special day when it's finally launched! 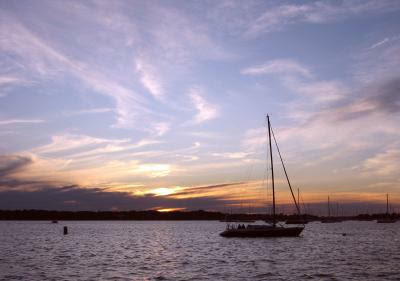 We returned to the boat to watch the sunset and then took Hoolie ashore again. Such is life on a boat, not bad.